mendo . portfolio . Gallery BonhanS.S. The May of 2005 brought warm weather and a website for the art gallery BonhanS.S with it. The design has been developed with respect to the general positioning strategy of the gallery, which postulates that the gallery is a portal leading to the world of art, and its website is a window through which a visitor may peep into the gallery. The website is spacious and light. It evokes positive emotions and definitely differs from other websites. As does the gallery itself. Navigation is original and interesting as well. Here users will find everything they need – information about the gallery and its services, as well as in-depth data on more than fifty artists represented by the gallery. To enjoy the paintings you do not need to leave the Internet – there are at least 180 paintings on BonhanS.S. website that you can look at. The design is delicate. The text reads smoothly. Illustrations make the site a special one. To view and study it is sheer delight. 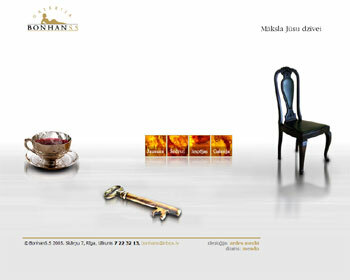 The website of BohnanS.S not only represents art; it is a piece of art itself.